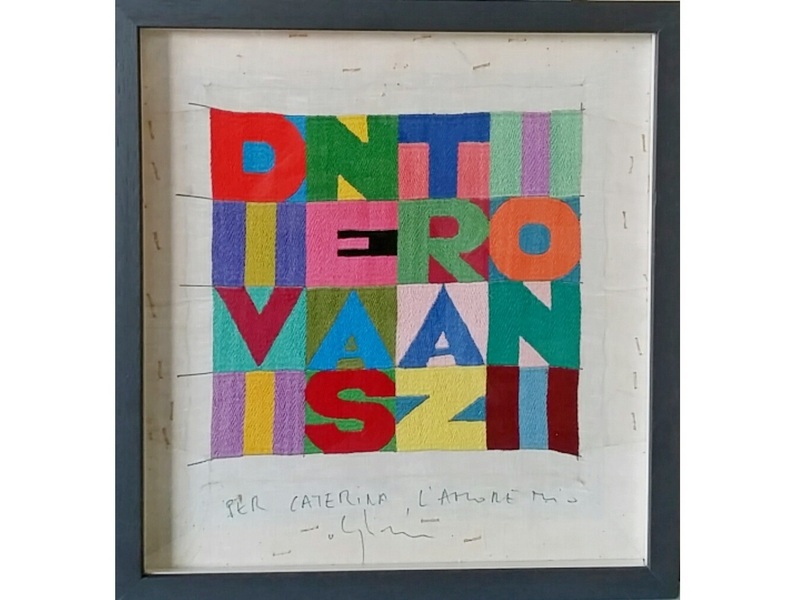 Alighiero Boetti (1940-1994) – or Alighiero e Boetti ( “e” means “and”) as the Artist signed his works from 1973 on – was born in Turin, where he started his activity joining the Arte Povera movement in January 1967. In 1972 he moved to Rome, where he discovered the pleasure of light and colours, far from the austerity of Turin. In 1971 he had discovered Afghanistan and in Kabul had started an artistic collaboration with women embroiderers, creating tapestries such as his political Maps which would evolve according to the world’s political mutations. As a conceptual and versatile artist, he has produced a great variety of artworks, delegating to other people the manual execution of some specific typologies, but in that case following very precise “rules of the game” and even high principles such as the 1971 Nobel Price Jacques Monod’s “Chance and necessity”. Among such pieces, the ballpoint pen Monochromes (blue, black, red, green) with a white coded writing coming out of the evenly doodled coloured surface; or the tapestries embroidered on cloth, not only the World Maps but also the multi-coloured “Magic Squares” of texts written in Italian and Persian as well as the “Tutto” (Everything), dense puzzles where indeed everything can be found ( newspaper silhouettes, figures of animals and shapes of domestic objects …) Other types of Boetti’s works are exclusively executed by his own hand: for example, his Postal Works that play on the mathematical permutation of different stamps, on the unpredictable adventure of a postal journey, and also (from 1980 on) on the hidden charm of written messages travelling inside the envelopes. Besides, also his early 1970s systematic ‘exercises’ by pencil on squared paper, based on musical and mathematical rhythms. And finally, throughout the 80s and 90s, here is his mixed technique on paper, in particular his colourful compositions with happy flocks of animals sliding along, with an explicit reminiscence of Etruscan or Pompeian ornaments. The idea of time, with its fascinating and ineluctable passing by, probably is the unifying topic in Boetti’s typological and iconographical plurality. Among the last works some are monumental indeed, such as the fifty one tapestries with texts in Italian and Persian (shown in Paris, at ‘Les Magiciens de la Terre’ exhibition, 1989), or else the fifty kilims exposed at the Magasin in Grenoble in December 1993, which was the last exhibition inaugurated in presence of the Artist, yet very ill at that time. Alighiero Boetti exposed his works in the most prestigious and emblematic exhibitions of his generation, from ‘When Attitudes Become Form’ (1969) to ‘Contemporanea’ (Rome 1973), from ‘Identité Italienne’ (Paris, 1981) to ‘The Italian Metamorphosis 1943-1968’ (Guggenheim Museum New York, 1994). Works of his were exposed at six editions of the Venice Biennale ; his personal exhibition room in the 1990 edition was awarded a special prize, and a posthumous homage show was presented in the 2001 edition. Not only his works but his choices as an artist strongly influenced the generation of artists that followed and many young people of the new millennium, in Italy and in the world. Alighiero Boetti: Minimum/Maximum - Fondazione Giorgio Cini, Venice.